Since you are all perfectly capable of reading the presentations I am not going to repeat what was said, but rather to say what my key take-aways were in general. Firstly I was super happy that I chose to come to this conference (at my own cost, although the conference itself was free …) instead of going to the EARCOS workshop in November at Taipei American School. “Tech-Integrated Libraries: Building the Future One Service at a Time”. The reason is that the longer I am in the field of teacher librarianship, the more I feel that we are operating in a number of little echo chambers where we keep on encountering the same people with the same things to share. This view probably doesn’t make me very popular amongst my peers, however I do think that it has contributed greatly to the current state of school librarianship. Of course this conference was also an echo chamber, but it wasn’t one which I usually find myself in (mine is the “international school librarian” one). And I think for all of us participating, we got to at least hear (if not share due to the time restrictions and presentation format) about what is going on elsewhere. And that is always incredibly interesting. Next – it was comforting but disheartening to hear that school librarians everywhere suffer from the same “needed outsider” status. In all the presentations we heard that the existence of the school library and its staffing by a tiered levels / qualifications of librarian almost always needed an act of legislation – at least in the public sector. (In the private sector it is up to the budget of the individual school, and part of a long legacy personal and cultural, but that’s a whole other story). Within the legislated necessity of a school library, there is a huge variation in the requirements – in Australia this is determined by state-by-state for example. It seems that generally it is much easier to find funding for library buildings and the initial “hardware” – the problems arise with the ongoing budgeting for staffing by properly trained teacher-librarians who can make a difference in both the literacy and information literacy of the students. But those effects are hard to measure – it is easier to come up with statistics concerning collection size and ratios of materials to pupils – the quantitative data is more readily found, and definitions are more robust than the qualitative data. That is one of the “academic / research” criticisms I’d have of some of the presentations – a lot of data but what about the “so what” and “why” and “what now” – particularly when comparing one country to another. Even Australia – who has long been seen as one of the bastions of school-teacher-librarianship -appears to be in decline due to all sorts of (mainly) political and funding issues. And there’s the rub. School-librarians just don’t seem to be political animals – up to now I have only ever met one Head of Libraries who has a seat-at-the-table by which I mean is considered part of the senior management team of a school. The rest seem to dabble around the edges, cajoling, convincing, offering, pleading, giving, trying, quietly adding value as and when possible on an invitation basis, if not plain forgotten. There is a distinct difference also between where school librarians are seen as partners for information literacy instruction versus their role in encouraging reading – or alphabetic literacy. 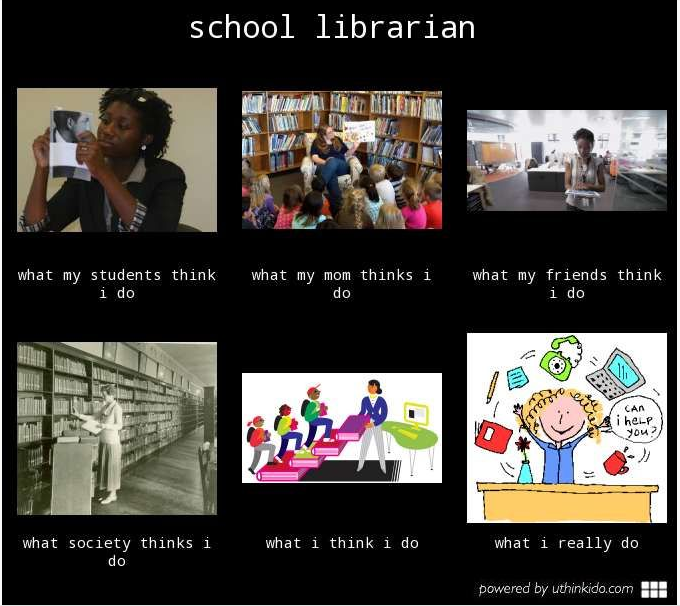 The distinction is very important, because it can be argued (and is argued) that a librarian can provide the former, so it is not necessary to have a teacher-librarian. In fact, a passionate library technician with a love of books and reading would even suffice (sadly to say, a love of reading is not on the ‘necessary qualities” in the job descriptions of most library staff that I’ve encountered – nor, may I add of teachers.). It was interesting to see that the contribution from Singapore was an extremely excellent presentation on “Interactive Reading Activities” but since public schools here generally don’t have libraries or teacher librarians there was no-one to present on the “state of the nation” in this regard. It begs the question what this otherwise progressive nation-state is doing to raise the standards of information literacy in its schools. What I really wish was I could say is “these guys are really getting it right – that’s the way to go and here’s the proof”. In reality all I can say is that it seems that we all share the same struggles and issues and that’s why I worry so very much about our librarian echo chambers. Because we all agree with each other, and we all have similar stories to share – stories of triumph and success, of making a difference in the lives of individual students and in (school) communities as a whole – the second afternoon where teacher librarians from 3 schools presented the fantastic work they’d been doing in Taiwan – particularly in the field of inquiry learning was very inspirational. But how do we get out of this loop and spiral upwards? 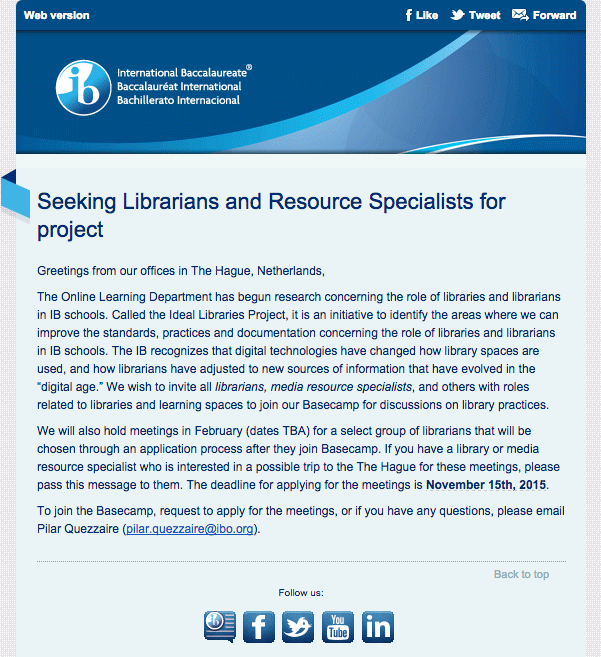 I’m one of the 407 librarians participating in the “Ideal Libraries Project” of the IBO. Even in that (private) organisation nothing is mandated or agreed around teacher-librarians. Yes there are recommendations, but judging by the responses from the cohort the interpretations are wide. I have meandered far I fear. But to my colleagues in Asian countries I would say, fear not, you are not alone, we too struggle with ratios of 1:1,500 (TL:Students), even in private schools. We too would like to feel our voices are heard and that literacies are integrated into the curriculum. But I think there is hope, if we can just get out of this quick-sand – perhaps when the hype around EdTech and Makerspaces is over we will have our turn – or perhaps it is time to rise up and take a seat at the table, because it is not about us. It’s about sending literate people out into the world, and we can’t faff around the edges and not send fully multi-literate students out into the world.